Let me preface this review with a disclaimer. Based on all of the other high review ratings on Goodreads, it would seem my frustrations with the plot leave me in the minority. So take this with a grain of salt as it could very well be just not to my preferences but a great read for everyone else. 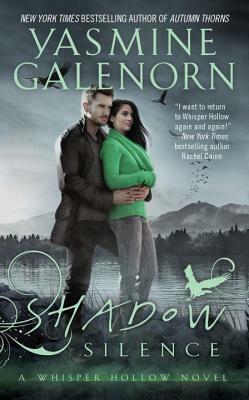 The plot in SHADOW SILENCE really did not work for me at all. It felt so obvious and contrived. Peggin, Kerris' best friend decides she needs to buy a house right by the lake. The very lake whose lady kills everyone she can lure in. In fact, said lady has been particularly "hungry" as of late, and has been more vicious and murderous, killing more than she ever has before. Peggin knows this and yet she still is determined to live in a house right by the lake. Kerris of course tries to talk her out of it, but Peggin gets rather snippy about it. To make matters worse everyone else all but scolds Kerris and tells her she's not Peggin's mother, so let her be. But lo and behold (and this is not a spoiler as it's in the blurb) on the FIRST DAY Peggin is moving into the house she's taken by the lady. She's extremely distraught and "beside" herself as she's now marked for death. I mean really come on?! She knew what she was getting into, and I just honestly could not find an ounce of sympathy for her. I realize it sounds rather cold, but it just was too contrived to me. Considering this issue involves almost the entire book, I found myself completely unattached. Speaking of unattached, I just didn't feel the same connection with Kerris as I did in the first book. There's a lot of filler here, and while she's supposed to be stronger and more confident, I really didn't see it this time around. She just came across as more afraid this time and it just didn't jive for me. I also wasn't really feeling the spark between her and Bryan this time around. I can't really put my finger on it, but it just wasn't working. Overall this one just was a whole lot of meh for me unfortunately, and considering the first book in this new series didn't really wow me either, I don't think I'll be continuing. It's a shame because I typically enjoy Yasmine's work, but this series has earned a pass from me. I greatly enjoyed Deborah Blake's Baba Yaga series, so when I heard she was writing a spin off series about the Riders I was incredibly excited. After the game changing events from the Baba series, I couldn't wait to see how things turned out for the riders. They were dealt one heck of a massive blow and their lives were turned upside down, so I knew their story would be one heck of a ride. And boy was I right. The riders, or at least or at least Day's story so far more than delivered. Day is incredibly wounded, damaged, gruff, and more than a little gun shy about women, and yet despite him not wanting too, more than a little of his weakness to damsels in distress has lingered over. It's funny, when Jenna was dropped into his lap, she was the absolute last thing he wanted. And yet, she wound up being exactly what he needed to start to turn the tide for him. Jenna comes with her own issues and baggage, but her determination and fire really drew me to her character and I felt she couldn't be any more perfect for Day. Oh of course, it's not instantly better and their ride and obstacles together are more than a little bumpy, but the journey between the two of them was more than enjoyable. Perfect for fans of the Baba Yaga series who are looking to see the much loved Riders get their own stories, DANGEROUSLY CHARMING is a great afternoon read, guaranteed to leave a smile on your face. MAGIC BINDS in a word was amazing. Just utterly fantastic. It was everything great about this series wrapped up into an amazing story and plotline and I absolutely loved every minute of this book. In fact I loved it so much, I wanted to start over and read it all again as soon as I finished. Considering I barely restrained from doing so, I definitely see a re-read of this fantastic book sometime in my near future. 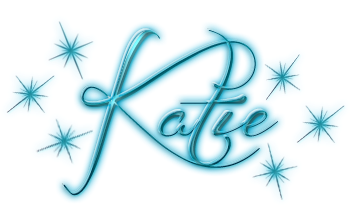 Kate really shined in MAGIC BINDS. Previously she always was this perfect icon of virtue. Despite being seemingly bloodthirsty she never let a man behind and never chose the easy or beneficial path. However, this time around we saw a bit of the darker side potential in her, and while she never actually faltered, the struggle made her feel just a bit more real, and I thoroughly enjoyed it. Moreso, the dynamic of all the other characters as they adjusted to this new, slightly darker Kate was more than entertaining as well. Curran's responses left me in hysterics at times, as well as the rest of the cast. I won't go further into detail to avoid spoiling things, but let me just say that all of the character dynamics in this one are completely spot on. 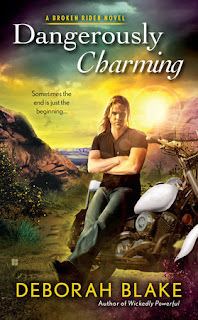 Simply put, if you're looking for one heck of a ride that not only keeps you on the edge of your seat the entire book, but will also leave you with a happy contented sigh at the end, MAGIC BINDS is the book for you. 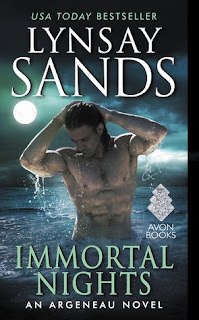 A fantastic book, series, characters, and plotline, I loved every minute of this book. Bravo! Man was this a fun and action packed read. Despite this being the 15th book in the series, there's no signs of things slowing down. In UNRAVELED, Gin like always finds herself in more than a little bit of a pickle and it's so much fun watching her untangle the latest mess. This time around the setting has changed a bit as Gin and co travel outside of Ashland. I found the new setting to be a refreshing change of pace. Despite them knowing they were walking into a trap from the get-go the plot was very gripping from the start. 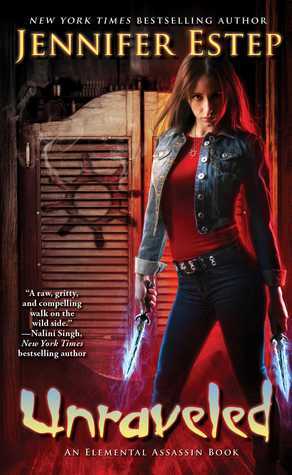 You would think since both I and the characters new danger was coming it wouldn't have quite the same intensity, and yet Jennifer Estep has pulled it off again. While the action and high stakes of these books are incredible, it's truly the characters and their relationships that steal the show. Gin of course is the all time favorite, but the supporting cast is so fully fleshed out as well that reading these books feels like coming home to friends. 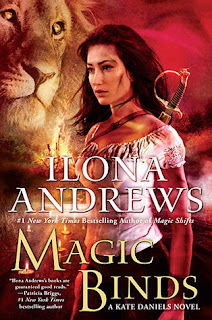 In the last books Gin and her foster brother Finn had more than a little shake up, and I particularly enjoyed them slowly starting to find their way back towards repairing their relationship. Throw in the various significant others, vampire assistants, friends, and even a new potential ally and it makes for one heck of a great read getting to see all the various dynamics. Simply put, I love this series, these fantastic characters, and incredibly high stakes plot. I simply cannot get enough of these books and I truly hope there are many more to come. 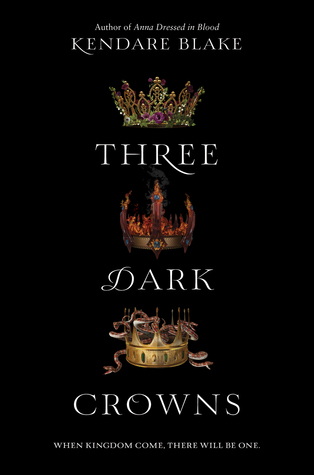 For such an interesting premise, THREE DARK CROWNS suffers from a lack of strong execution. From the blurb, I was thoroughly hooked, however upon reading, especially at first, I was less than enamored. The book starts off in the middle of things to the point where it's incredibly confusing as to what's going on. I had to go back twice to make sure my kindle didn't accidentally start at a few chapters in. But unfortunately that wasn't the case so I mustered on. I have to admit I almost DNF this book several times. Nothing really happens, nothing is explained, nothing made sense, and frankly not a single one of the characters aside from one side one really caught my attention until pretty far into the book. It's hard to root for someone to win when none of them seem worthy and/or remarkable enough to really get behind them. With that ringing endorsement, you are probably wondering why I kept reading and didn't give up on the book, and why I wound up rating it a 3 rather than lower. Somehow despite my confusion and lack of attachment to the characters, after the first few chapters I found myself oddly hooked. I just couldn't stop reading. The premise and the world is incredibly fascinating, and while the continually rotating perspectives made it hard to get attached to any one character it was rather addicting much to my surprise. There's just something so dark and twisted about the story, and I especially enjoyed how every path that seemed to light would twist and turn and wind up leading back down a dark path again. Those aspects of the story kept me on my toes and turning the pages. By the end the three sisters all seemed to have found their identities and chutzpah. It should make for one heck of a showdown once things come to a head if the last few chapters of this one are any indication. 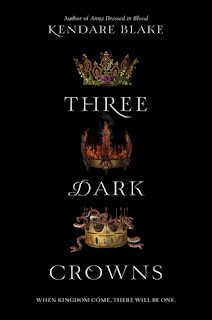 Overall I'd say THREE DARK CROWNS is one heck of a "sleeper" hit that sneaks up on you. From starting out so rocky, it rather impressed me at the end. I have very high hopes for this dark and twisted series, and can honestly say I'm dying to get my hands on the next book.